Space news! At some point in the very near future, Kerbal Space Program will receive its next update. Catchily titled Kerbal Space Program 0.25, it’s the largest update since the release of First Contract over a month ago, introducing a whole host of changes to the space-rocket-explosion-resulting-in-astronaut-stranded-in-orbit simulator. Developer Squad has kindly shared with us the roadmap for their game’s next iteration. Here’s what to expect in Kerbal Space Program 0.25. Related: Check our guide to the best space games. 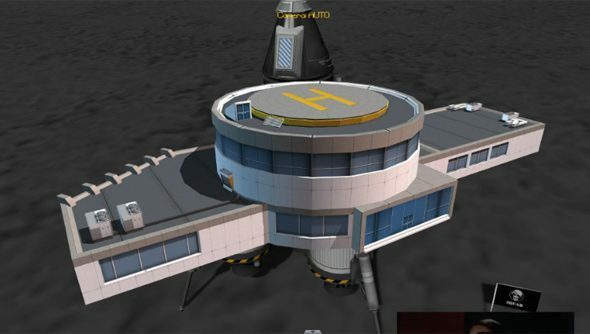 Firstly, the update will introduce the Administration Building, a new facility at the space centre that allows players to specialise by choosing from a number of different Strategies. These Strategies will boost certain resources at the expense of others. For example, the Unpaid Internship Program will give you a better science yield while hurting your reputation. Conversely, adopting the Open Source Technologies Initiative will give you a better reputation while decreasing your science rewards. The update will also overhaul particle and sound effects, so expect improved rocket trails and better sounding explosions. The Spaceplane Plus mod will become integrated into the main game alongside several new spaceplane parts. A couple of accessibility improvements will introduce markers on the navball to point towards wayward nodes, so no more spinning your ship around looking for your vector. You’ll also be able to transfer Kerbals between parts without having them leave the craft, which means fewer spacewalks around your station. There’s also a new ‘maximum thrust’ button on the way, hopefully not bound anywhere near the ‘cut thrust’ key. Difficulty settings are getting their own bespoke panel, from which you can tweak options to make your missions more or less challenging. The option to revert to the launchpad can be disabled, or your starting funds in career mod can be boosted. Kerbals will keep persistent career logs that store where they’ve been and what they’ve done. Recovering Kerbals will reward you with reputation based on their accomplishments, while the overall experience rating of a Kerbal will affect the cost of assigning them to a mission. The team at Squad anticipates testing on 0.25 to begin soon, and stress wholeheartedly that any of the above plans can change. They are a flexible and unpredictable bunch, like a strutless space station, wibbling away in orbit.